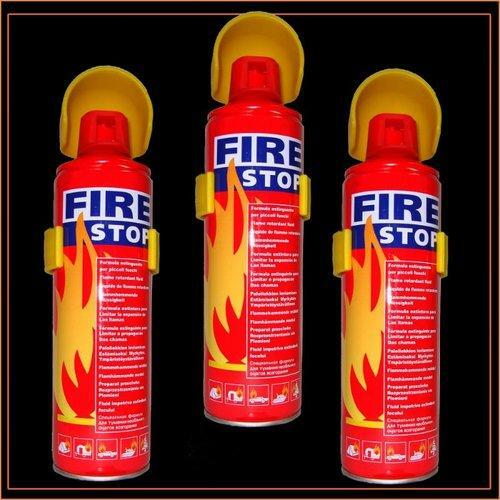 Product Information : Fire Extinguisher for Car, Home, other places where a handy fire extinguishers are required are now an essential part for every vehicle and home safety kit. A car fire extinguisher is a specialty product designed to do a specific job. Although your vehicle is assembled with optimum safety in mind, many of its components are potential fire hazards. Should you encounter a sudden and dangerous fire situation, having a fire extinguisher on hand will allow you to fight the blaze and deter excessive vehicle damage. General Properties of a Quality Car Fire Extinguisher Shopping for a fire extinguisher to store in your vehicle for safety purposes can be overwhelming. Fire extinguisher (500ml) with Holder Case or Stand Can be fixed on wall or in car Used for home, car, shop and factory, etc. Simple structure, flexible operation, convenient application Fast extinguishing speed, high efficiency Non-Toxic, Environmentally Friendly. About the Product Essential part of every vehicle and home safety kit Light weigh. Can be fixed on wall or in car Fast extinguishing speed, high efficiency Simple structure, flexible operation, convenient. 1.Impregnate around minor fire whatever their cause , so as to avoid flame expansion . 2.Extinguish minor fire. Non-toxic. Environmentally safe. Ozone friendly . 3.Charge with aqueous film-forming extinguishant and employ nitrogen as driving gas . 4.Used to put out fires of solid organic matter, oil, flammableliquid gas in the initial stage (not applicable for electric facilities). 5.Easy to operate and enjoys high fire-fighting efficiency and long termstorage. 6. Widely used in plants warehouses, institutions, schools, marketplaces,hotels, vehicles, vessels, etc. Company is a Delhi based and authorized dealer of Cobra self defense pepper Sprays. The tool is SELF DEFENCE PEPPER SPRAY (COBRA MAGNUM EM) which is used for self defense. 6. It has spray range of upto 12ft. 7. Enough to handle a small mob of 10 people (approx). 7. Security Personnel at Hotels, Banks, BPOs, etc. These are the places where one need to be highly alert and conscious and should be armed with a tool which can handle a small mob of 10-12 people creating any sort of inevitable incidences.